Packers outside linebacker Clay Matthews on the field before the recent game against the Dallas Cowboys at AT&T Stadium. 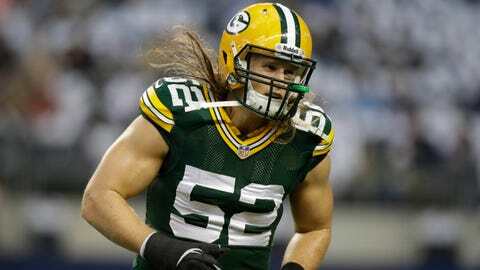 GREEN BAY, Wis. — The outlook for Green Bay Packers star outside linebacker Clay Matthews isn’t promising. Matthews suffered what coach Mike McCarthy described as a "repeat injury," leaving Sunday’s game in obvious pain in his surgically repaired right thumb. "The training staff didn’t feel very good about the injury," McCarthy said Monday. Matthews suffered a Bennett’s fracture in his right thumb on Oct. 6 and had surgery the next day. He missed the next four games then returned with a giant club over his entire right hand. The club soon became a small cast, which Matthews was still playing with when he reinjured his thumb after sacking Pittsburgh Steelers quarterback Ben Roethlisberger. Strangely, of Matthews’ 7.5 sacks this season, he’s been injured on three of them. He hurt his hamstring in Week 3 sacking Cincinnati Bengals quarterback Andy Dalton, originally broke his thumb sacking Detroit Lions quarterback Matthew Stafford and now this. While Matthews’ chance to play in Green Bay’s regular-season finale in Chicago looks bleak, the Packers have slightly more encouraging news on two other key players. Running back Eddie Lacy reinjured his sprained right ankle against Pittsburgh and did not return. "Eddie, he’s sore, which he has been pretty much the whole season," McCarthy said. "We’re not going to practice on the field until Thursday, so I’ll probably have a better feel for where he’s at then." Wide receiver Randall Cobb has been on injured reserve — with the team’s designation to return — since he fractured his tibia Oct. 13. He was eligible to return Week 15, but Cobb wasn’t near ready to play in a game at that time. Cobb just began running simple routes two weeks ago and admitted Dec. 18 that he still wasn’t full speed. Though it seems unlikely Cobb will play Sunday against the Bears, McCarthy plans to test him out this week. "Randall is going to practice more," McCarthy said. "He’s still under the status of being on injured reserve, but we will up his practice reps on Thursday." Cobb will first need to be placed on the active roster again, but that won’t be a struggle for the Packers because they have two spots open after placing defensive lineman Johnny Jolly and tight end Brandon Bostick on season-ending injured reserve this past weekend.